Okkervil River doesn't get mad. But they've really never been a band that gets even either. For all the pain and darkness combined poetically in The Stage Names and The Stand Ins, Will Sheff and Co. only rarely used their distemper and modern frustration to build a fire. Instead, they're ire was mostly bluster, mirroring a sort of faux-soapbox argument common to post-modern literature. Essentially, they were always saying "We're all pissed. We're all disappointed. We're all screaming. But we're all aware that it's all a lot of sound and fury signifying nothing." Each of our great emotional outbursts eventually fall apart into a whisper, or worse, a whimper that leaves us alone with our individual experience. Of course, those were concepts albums, designed to capture just that, and while The Stand Ins faltered some, never quite capturing the catchiness of its predecessor, the mission statement remained the same. 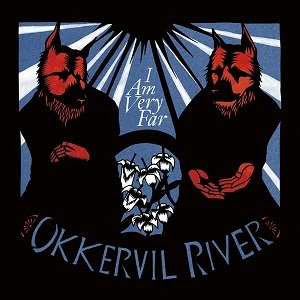 Now, with I Am Very Far, Okkervil River delivers a similar thesis, but with a more soothing, laid back vibe. And on more tracks than previous albums, they also ramp up the guitar and drums, relying on heavier, more powerful instrumentation to deal out their poetry. The themes are still largely the same. But the energy is different and arguably more palatable. Opening strong with "The Valley," guitars and drums are paramount. And Sheff's vocals are layered, thick and without the vulnerable, voice-cracking, pained design they have bore on previous discs. It's an elegant track, on that seems to harness the "new folk rock" vibe that happened with Bill Callahan's newest too. Marching, sturdy and powerful. "Piratess" maintains that energy, but infuses a bass line and back beat that nearly touches on pop-soul. And while Sheff croons, the song holds onto a crunchy, production-heavy vibe that has been unusual and elusive on their other work. It's a departure and a great one, adding a new decoration to a lush sonic landscape. "Rider" feels vaguely like a Springsteen or Mellancamp track with hard-hitting, bounding drums. "Lay of the Last Survivor" finally takes on some of Okkervil's traditional story-telling vulnerability. Sheff's voice, the one we're used to, comes back in full swing to whisper a tale of death and loss. And the piano garnishes are beautiful here. "White Shadow Waltz" keeps that theme going as Sheff continues to cry out through charging strings and possibly the most ambitious instrumentation on the album. It's a song that builds and builds, fighting forward until breaks apart, intentionally, under its own energy. "We Need A Myth" is a big time theatrical anthem that could find a place in a rock opera somewhere. It lives by trickling piano, grungy guitar work, and a set of poetic lyrics that capture disaffection attached with an overly-explained world. Essentially, we know too much, and myths would at least give us the wonder we need back. "Mermaid" is great and subtle. Calm and sweet. And "Show Yourself" is the same way. A song that whispers more than it glowers. Utters more than it insists. It picks up the pace nearing the halfway mark, but never completely explodes, content to let its message hang over the listener like a cloud with self-contained lightning. It's a build that doesn't completely storm, but hints at something massive over the horizon that could come. "Your Past Life as a Blast" is rousing and echo-y. "Wake And Be Fine" is brilliant, thunderous and piano-heavy. It's easily the gem buried near the album's end. Fast talking and sturdy in its waltz, it's really a wonderful track. And "The Rise" allows everything to finish out on a brilliant note of calm piano and call-and-response (Sheff on Sheff... which is very interesting). The song is sweeping, with trembling cymbals, and another extremely theatrical design. The only problem with it is that Sheff's voice isn't perfect for such a demonstration of crooning beauty. It gives the song its own style, and it's Okkervil River, so really, it's expected, but it ever-so-slightly undercuts the inherent beauty of the music. Luckily, there's a little bit of a Sufjan vibe happening throughout that not only holds interest, but captivates it. Check out the album below, streaming on that little player right there. And then if take a chance on picking up a few tracks, or if you desire the wondrous quality of packaging and the essence of a true album, get the disc or LP, and look out for the lyric chapbook too. Okkervil River is always willing to challenge listeners by pushing poetry into strange corners, and conversely, push rock/folk into poetic corners. Sometimes it works perfectly, sometimes it feels a little forced, but ultimately I Am Very Far is an exceptional collection of songs that show their widest range of experimentation and influence yet. Its scale is epic. Its execution is excellent. And its satisfaction with modern existence is somewhat greater than before.